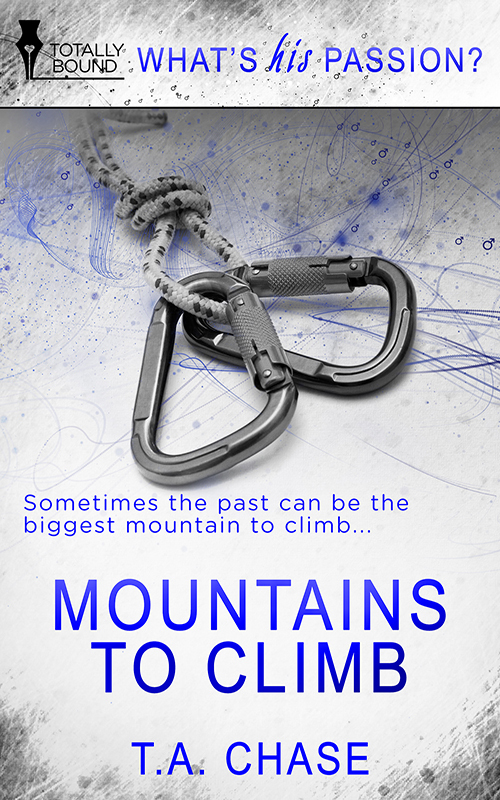 While Erin & I continue to get ourselves back on schedule after the holiday weekend and the Great June 2014 Edit (which is currently being followed by the Lesser July 2014 Edit), we wanted to being you one more preview of a new book from Totally Bound, Mountains to Climb. We basically couldn’t resist, because while it’s not necessarily a major part of the plot (although it brings us two key moments in Doves) Alex takes up rock climbing himself, and we couldn’t help but ponder what might be on his bookshelves. Sometimes the past can be the biggest mountain to climb. Toby Schwartzel has never forgotten Jensen Brockhoff, the man he loved and the one who disappeared six years ago. He thinks he’s moved on, but when Jensen appears again and wants to explain what happened, Toby realises he hasn’t gotten over Jensen. He’d only built up walls to keep from being hurt again. Jensen Brockhoff left New York City and Toby Schwartzel for several reasons. All of them had to do with drugs and alcohol. He’s clean now and the only thing he’s addicted to is mountain climbing. His passion for the sport has got him through the last six years. But after a particularly harrowing fall on Denali, Jensen knows he has to go back to tell Toby the truth. Will Toby and Jensen discover they’d never moved past the love they had for each other all those years ago? Or are the mountains between them too high to climb? The author, T.A. Chase, also gave us some content about their process. Since we talk about how we do things a lot, we thought you might be interested in how other people do stuff too. The non-chronological order thing interested us in particular, because while Starling and Doves were written fairly linearly, writing a series means sometimes you have to go back and stitch up some gaps (Erin will be posted about the series process later today), and our drafting process on book three of the series (it has a title, we’re just not telling it to you yet) has been far less linear. Thank you for having me here today. I’m T.A. Chase and I write m/m romance. I’m here to tell you the way I write. Hope you’re interested in that. How do I come up with the ideas for my stories? I get them from everywhere. Movies. TV. Real life conversations and situations. But I have to say a majority of them come from songs. I love music and a lot of my stories start from a lyric. Sometimes a character pops into my head and demands his story be told. He might be loud and obnoxious or soft spoken and self-effacing. He knows that his story will interest people, so he decides he wants me to tell it. Other times, I read an article or watch a TV show and a little bit of trivia will spark my interest. Like for Mountains to Climb, I’d been watching a show on mountain climbing and I thought how it could become a passion or obsession with people, so it would fit in with the whole idea behind What’s His Passion? imprint. Then there are the times when I hear a lyric or a song and something starts coming together in my mind. It works because a lot of songs do tell a story, we just have to listen closely to figure out what it is. I don’t always write in chronological order either. A lot of times I write the first two chapters then skip to the last chapter. Once the last scene is written, I go back and fill in the middle section. Sometimes it all comes together perfectly and I don’t have to rework the ending to fit what my characters did during the middle. Other times, I do have to fix things because they didn’t go where I wanted them to go. Characters have a mind of their own, and zig when we want them to zag. I don’t tend to outline or plot anything out. I like finding out the story the same way the readers do. Most of the time, I’m surprised by what my characters say or do and that makes me happy. If you want to win this and/or other free books from Totally Bound, they are doing a big giveaway right now, so do the clicky clicky thing to enter to win free stuff! This entry was posted in books, Doves, Other people's books, Starling, Story Process Sunday, Writing and tagged books, Doves, lgbt romance, m/m romance, other people's books, Process, Starling, Writing. Bookmark the permalink. One of my reading teachers used to call this non-linear stuff “writing inside-out.” She did it too. She wrote major plot points and then built a story around them. And she has like a hundred books or something in print, so I suppose it worked. I’d be interested to read this. My book-planning brain doesn’t really work in series mode, but sometimes I will write one-off scenes as character work and forget if it’s in the manuscript or not.